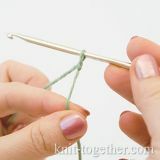 Knit Together | How to choose the crochet hook and the yarn. Crochet Lessons for beginners. 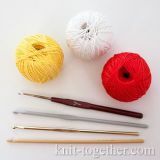 The first crochet lesson we begin with selection of crochet hook and yarn for your project. Now we will not stop on a wide variety of a crochet hooks which exist. If you will be keen on this kind of needlework, then gradually you will learn more about crochet hooks. 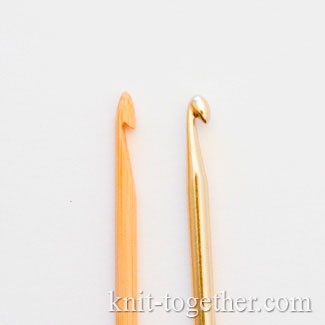 For learning you must to choose not too thick and not too thin the crochet hook, for example: 3 mm, 3.5 mm or 4 mm. Crochet hook sizes determined by the thickness of his head in millimeters. 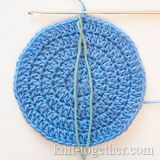 For usual crochet is required a short hook of size 12 - 15 cm. 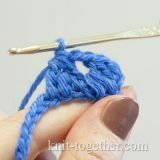 More long hook of size 30 - 45 cm is used for Tunisian crochet. Some hooks have a place for thumb rest, these hooks convenient to hold. For studying better to buy metal hook, it maybe from stainless steel or aluminium with coating (teflon, silver spraying, etc.). The aluminium hooks without coating spoil hands and yarn. Please note that the head of the hook was not too pointy, otherwise you may injure your fingers. In the photo top-down: metal hook with teflon coating (4 mm), metal hook (3.5 mm), bamboo hook (3.5 mm), hook with handle (1.5 mm). 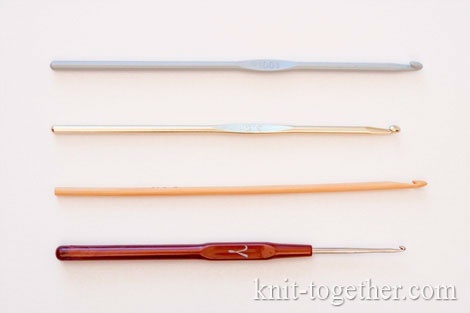 Bamboo crochet hooks are liked many crocheters, but for studying better don't use them. Their heads sharpened more acute and more rough. These hooks are good for smooth yarn. Crochet hooks are often made with handle. 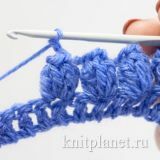 When you will learn to crochet, then you will be able choose for yourself an optimal variant of hook. 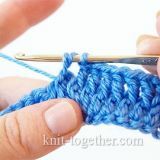 The size of hook must match the thickness of yarn: as a rule, hook is thicker yarn in 1.5 - 2 times. Usually manufacturers indicate the recommended size of the hook on the yarn label. 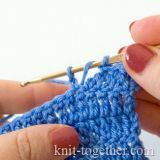 For learning, select a smooth light yarn, of average thickness, of acrylic or mixed (wool - acrylic). 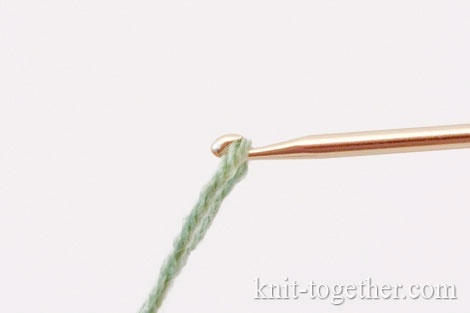 In shop, when you are choosing a crochet hook, please note how yarn lies in the throat of the hook. The yarn must to lie freely but doesn't must to slip out. We used in the lessons: metal hook 3.5 mm and yarn "Baby" (135 m / 50g, 20% wool, 80 % acrylic.). Next lesson: How to hold the crochet hook and the yarn.